Here's a quick look at what I used up in December! I've started keeping track of this for myself so I can look back at some of my favorites, and some of my not so favorites. It gives me a great sense of empowerment to use something up for some reason, especially when I see the total accumulation. I also think it helps me to buy less when I have a goal to use some of what I already have first. Maybe you might find something of interest for yourself, or find some of the mini reviews for each product to be helpful. 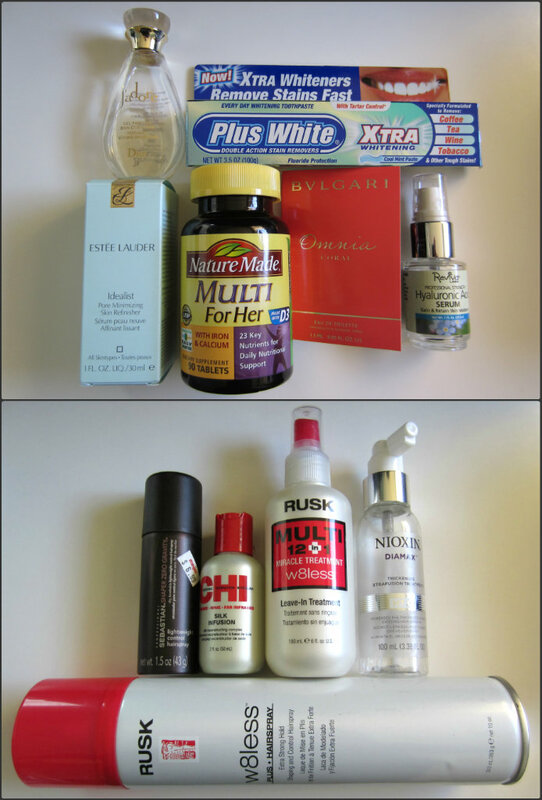 Like each month, there were some hits and misses...some routine things I used up that I always replace so that I'm never without them, some products that I won't replace, and some products that I would buy again. I seem to have used up quite a few hair products this month, which is part of my goal: use up some of what I have before buying more! J'adore Perfumed Bath & Shower Gel: This was a small bottle that was included in a gift set along with a full sized fragrance. They now make this in a creamy version rather than the clear gel version that I had, so I can't provide a link or price for this exact product. J'adore is a favorite fragrance of mine, so I would buy this again. Plus White Xtra Whitening Toothpaste: A staple item for me, and I always have a spare tube at the ready to replace it. I use this after a regular toothpaste, and it really does make a difference for me. Retail: $3.37/3.5 oz. Reviva Labs Hyaluronic Acid Serum: Another staple item for me. This was also in my used up November post, but I found another partially used one tucked away and used it up this month. This product introduced me to the world of hyaluronic acid, and I've since accumulated all kinds of products that contain HA. I use it on my face and lips to add and retain moisture, thereby plumping up fine lines. It also does a good job of firming and evening out my skin's texture. I only need one or two pumps per application, so a bottle lasts me about 2 months. Retail: $22.00/1 oz. Bvlgari Omnia Coral Eau de Toilette: This was a sample size from Sephora, and I think it would be a nice scent for Summer. It's light, a little tropical, and not too sweet. It didn't last long on me though, and while I liked it, I didn't love it. The notes are Bergamot, Goji Berries, Hibiscus Flower, Water Lily, Pomegranate, and Cedar Wood. Retail: $64.00/1.35 oz. Estee Lauder Idealist Pore Minimizing Skin Refinisher: I've rediscovered Estee Lauder's color cosmetics since Tom Pecheaux became their Creative Makeup Director a couple of years back. Spending so much time at the EL counter, I was bound to pick up some of their skin care along the way! This particular product feels wonderful on my skin, has a lovely scent, and does give my skin a nice look. I bought it in hopes of seeing some real reduction in the size of my pores though, and I didn't notice enough change in that area to contine spending this much money on it. I've had much better luck with Skinn's Pure Pore Cleanser, so I'll stick with that for now. Retail: $52.00/1 oz. Sebastian Shaper Zero Gravity Hairspray: I picked this up on my way out of town to carry in my bag on a short trip, but I won't buy it again. Sebastian Shaper in the white can is my favorite hairspray, but this is nothing like that one. It holds well--too well, in fact. I just need a light spray around the front of my hair, and this was far too stiff of a hold for my liking! I paid $6.99 for this tiny can at Meijer, but I see it much cheaper on line. Retail: $3.95/1.5 oz. CHI Silk Infusion: Another holy grail item for me. I've used this product for many years, and it performs consistently well for me. It adds shine, smoothness, protects from heat damage, and strengthens my hair to prevent further damage. I'm testing a similar product right now from Rusk, and it seems to be working pretty well for now, but I think in the end, I'll still prefer the CHI. Retail: $14.00/2 oz. Rusk W8less Multi 12-in-1 Leave In Treatment: I just finished using my second bottle of this, and I would definitely buy it again. You can read my full review here. I'm trying to use up some similar products before I buy more, but I'm finding I need to use 2-3 different products to produce the same look that this one does on its own. Retail: $8.95/6 oz. Nioxin Intense Therapy Diamax Thickening Xtrafusion Treatment: I was not graced with thick luxurious hair, and I have spent the better part of my life trying to find something that not only makes it look thicker, but actually makes it be thicker. This is the first product I've ever used that really does thicken my hair. It adds volume, it isn't sticky, there's far less hair going down the drain, and it's even producing new hair. I thought my flyaways were getting extremely noticeable a few months back, and I mentioned it to my hair stylist. She looked all around my hair and told me they weren't flyaways, but new hair. I had to use it for 2 months straight before I noticed new growth, but the look and feel of thicker hair was immediate. I paid retail at my salon for the first bottle ($50.00--yikes! ), then I began ordering it from Amazon. It ranges everytime I've ordered it, but it's usually around $22.00-$28.00. The good news is, I'm testing a product from Pantene that seems to working exactly the same. I can't say that with total certainty yet, but so far, so good. This would allow me to have better accessibility because the Pantene is sold at chain retailers, and it's at least $5.00 less. Retail: $22.00/3.38 oz. Rusk Designer Collection W8less Plus Hairspray: This isn't a bad product, but it makes my hair look a little dry and it also seems to diminish the shine slightly. So no, I doubt I'd use this product again. You can view my full review here. Retail: $10.95/10 oz. That's it for the December Use It Up Roundup! *Some products featured were furnished for consideration. I started a new blog- I'm a new blogger! I think my empties or used up posts will be 2-3 months, because I don't think I can use up products fast enough. You have a lot here! Good for you! I hate waste! Will you check out my blog, I would love some feedback! Great post! I love to use stuff up, too--it's a good feeling. I'm trying to use up all the odds & ends of toiletry stuff before I buy more. . . . I have that Bvlgari Coral sample you're talking about--I need to pull it out and use it. I give all the perfume samples I try to my sister, if I don't like them. Thank you for explaining each item and how it worked for you. I enjoyed reading it!